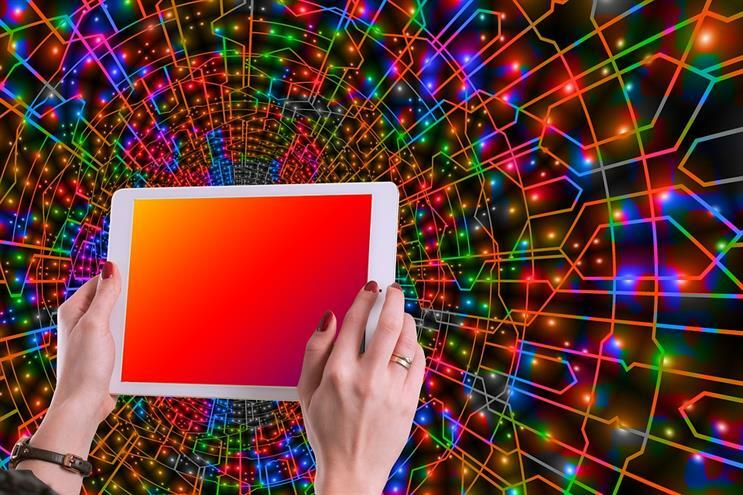 Marketers who use data to inform creativity can drive double the revenue growth of companies that do not integrate the two disciplines, according to a study by McKinsey. The management consulting firm, which unveiled its research at Cannes Lions, said it found a split between those chief marketing officers who feel "there is no relationship between data and creativity", and those who believe data-driven practices can improve the customer experience and "raise the bar on creativity". McKinsey warned that there is a significant minority of chief marketing officers who do not incorporate data and analytics into the creative process and they could be potentially missing out on growth opportunities. Jason Heller, global lead of digital marketing operations & technology at McKinsey, said: "There is this bifurcated world where you have some CMOs that have this religious zealousness over protecting the soul of creativity in their brand and feel like data has no role in it whatsoever. "And then there’s this other group of CMOs who feel like data is actually enhancing creativity." McKinsey teamed up with the US Association of National Advertisers and interviewed more than 200 chief marketing officers for its report, called The Perfect Union: Unlocking the Next Wave of Growth by Unifying Creativity and Analytics. It also carried out a survey of S&P 500 companies that found those businesses that have united data and creativity generated an average of 10% revenue growth, compared to 5% for those businesses that did not integrate them. Some creative directors, designers and copywriters believe "creativity is an instinctual process of building emotional bonds with consumers" and think that using "too much quantitative analysis" will mean "the magic dies", the report explains. But McKinsey claimed "the best marketers" recognise that integrating creativity and data can improve many areas, including brand strategy, consumer insights, customer experience and product design. The management consulting firm has dubbed these chief marketing officers "integrators" because they "continuously and rigorously" incorporate data in their creative work and incorporate creative thinking in their data-driven work. 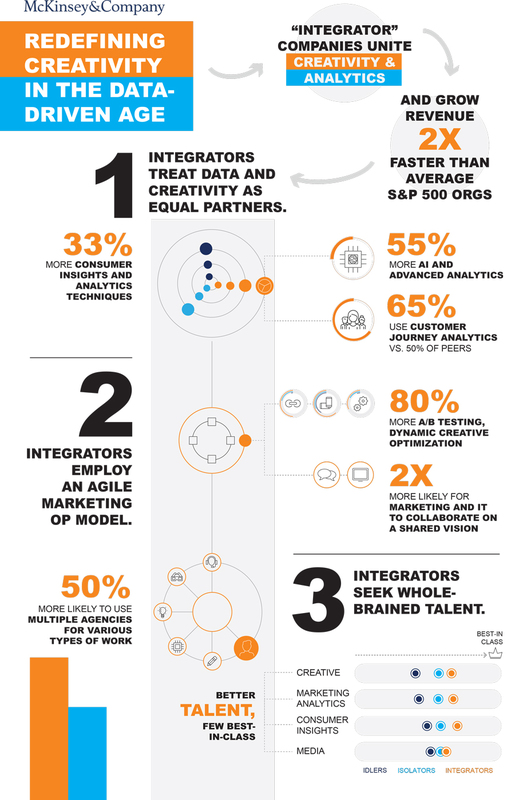 The "integrators" are more likely to use four or more types of insight and analytics and to build small, agile "cross-functional" teams with talent from IT and operations from elsewhere in their company. They are also likely to in-source data and analytics and "bring them close to the vest" which can drive better financial results, according to Heller, who said this set-up was a "hallmark" of growth companies. These chief marketing officers "no longer see themselves primarily as stewards of the company’s brand but as drivers of company growth". By contrast, McKinsey described chief marketing officers who use creativity and data but do not integrate them as "isolators" and those who use only an "insignificant" amount of data as "idlers". Half of integrators say they "work together on a shared vision" with their IT department whereas only 22% of isolators and 4% of idlers do so. McKinsey said this shift in strategic thinking – treating creativity and data as "equal partners" – means smart marketers are now looking for "whole-brain" talent that can combine right-brain, creative thinking and a left-brain, scientific approach. The report quotes one anonymous chief marketing officer who said: "You don’t create exciting things for people by figuring out things from data." McKinsey disagrees: "Actually, we believe that’s exactly what data can do. Analytics are what companies have learned about people’s behaviour. "Such insights can guide and inform where imagination needs to go. In the best cases, they can even inspire." McKinsey is one of a number of management consultants, including Accenture, Deloitte and IBM, which are becoming more involved in digital marketing services and have a significant presence at this year's Cannes Lions for a second year in a row. Heller said McKinsey is not trying to create a "standalone, agency-like offering in the way that Accenture or Deloitte" are doing. "Our interest is really anything that is contributing measurably to driving the growth of an organisation," he said. Some ad agency leaders have questioned whether consulting firms can easily move into marketing services. Sir Martin Sorrell recalled at last year’s Cannes Lions how William Eccleshare, now the chairman and chief executive of Clear Channel International, left WPP to go to McKinsey and then returned to the ad group. "I remember saying to him: ‘What’s the difference between McKinsey and WPP?’" Sorrell said. "And he said, ‘At McKinsey, they say: it is a fact that. At WPP, they say: I think that.’ That’s a very fair way of putting it. One is more science and one is more art." McKinsey’s new study suggests that chief marketing officers want to merge the two worlds of "data and human ingenuity". Brian Gregg, senior partner at McKinsey in San Francisco, said: "The new high-performing marketing team of the future has to find a way to create a blending of the two. "It's not just about bringing data into the creative process. It's about bringing creativity into the data process. This is a flow at both ends."